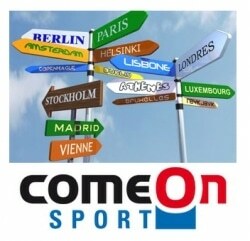 Sports tours, teams travel, tournaments, pre-season trips and sport preparation : here are the aims of ComeOn Sport. 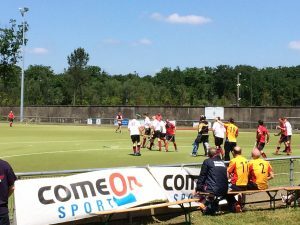 ComeOn Sport was created in 2003 and has organized over 1000 sports tours for rugby club, hockey clubs, football clubs, basketball clubs etc…. ComeOn Sport is a french sports agency that give a high quality of organization for your tour to France. Our great network of clubs, partnerships with hotels chains and suppliers, we are able to deliver the a high quality of playing tours at the best value for money. Each team is different, each team has its own needs, its now budget, no two teams are the same, no two teams has the same budget or want the same so this is why we at ComeOn Sport/ComeOn Tours provide you with a “tailor made sport solution” at the best price. Choosing a French sport agency for discovering France on a rugby tour or football tour is probably the best choice you have ever made when deciding to do an exciting rugby tour. Working with the hotel industry, the transport industry & the tourist industry, we always use the best suppliers in terms of accommodation, transportation and activities and always calculate the best price and the fair price for each tour. We provide local assistance to teams travelling to France and provide a high standing of quality. How it works? Visit our website, choose your options, destinations and the period you wanna travel and get in touch with us in order to check availability and what is included in the price. Easy and direct, we let you know what is possible and what your team will get for the price. We provide tailored global sports packages for leading sports teams, schools and clubs of all age groups and all levels of ability from veterans, senior sides and social teams to universities, schools and youths. Get in touch with us to learn more. ComeOn TOURS is a brand dedicated to the organization of tailor-made sports tours & playing tours for clubs and sports teams. ComeOn EVENTS is a brand dedicated to the creation and organization of sports events from A to Z in partnership with sports clubs. ComeOn ADVERTS is a brand dedicated to the promotion of existing events and organized by sports clubs. Strongly experienced, we always offer you the best services for your trip according to your needs and budget. Why spend more when you can spend less ??!! Tailor made sport packages are made at the good value. We at ComeOn Sport/ComeOn Tours provide you with a “tailor made sport solution” at the best price. Since 2003, it’s over 1000 teams that have toured our country and Europe with our service. the leaders of the Sports events travel on the French market as well as corporate hospitality and travel tips about sports vacation in France. Playing tours, rugby tours, hockey tournaments, soccer tours, Basketball tours etc…. Sport tours provide youth teams with the opportunity to travel to and compete against sport teams from other countries in Europe or further. Visit our sport packages on our website and find out your next tour! With ComeOn Sport, you save time and money. Sports tours are unique occasions to visit a new country and culture as a team group and this is why it’s always special. It helps the team in playing better and know each other. With low cost airline companies such as Ryanair, Aer Lingus, Easyjet or even Air France (tarifs mini), it’s easy and cheap to travel and to come over France. ComeOn Sport is fully protected and covered in terms of insurance. Our General Liability Insurance is the fundamental insurance that most businesses have and ComeOn Sport are covered by HISCOX for its activities (HISCOX Insurance Co Ltd Contract n° HA RCP 0281587).